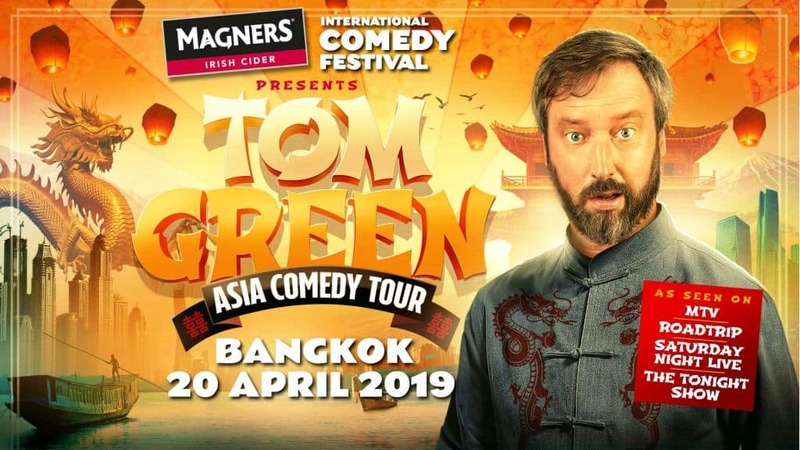 Internationally acclaimed actor and comedian Tom Green heads to Bangkok and Phuket with his Asian debut as part of the Magners International Comedy Festival 2019. His controversial comedy show ‘The Tom Green Show’ is an original, daring and absolutely cringe-inducing prank show and a first of its kind. Tom Green, the Cult 90’s comedy star and SNL star bring his cringe-inducing comedy to Thailand as he makes his Asian debut in 2019. Internationally acclaimed actor and comedian Tom Green head to Bangkok and Phuket with his Asian debut as part of the Magners International Comedy Festival 2019. Part of the 90s MTV comedy generation, his controversial comedy show ‘The Tom Green Show’ was an original, daring and absolutely cringe-inducing prank show and a first of its kind. Green was regarded as the bad-boy groundbreaking comedy innovator, bringing man-on-the-street trickster content, way before Youtube stars and streaming possibilities existed for extrovert and prankster personalities. One of Tom’s most famous sketches saw him pretending to, well…we will let you work that one out… a dead moose. A dangerous act which paid off when it won him a reference in Eminem’s number one hit “The Real Slim Shady” in the year 2000. Amongst other films, Tom also starred in the Hollywood hit ‘Charlie’s Angels’ alongside Drew Barrymore, who he later went on to marry. Since then, he has indeed risen in the showbiz ranks, having graced the cover of Rolling Stone magazine, hosted SNL, and appeared on The Daily Show. The comedian will make his way across Hong Kong, Vietnam, Tokyo and Singapore alongside Thailand. The sold-out stand-up show is currently receiving extensive rave reviews, and Green is consistently being commended on his comedic accessibility with a show that is proving hilarious for a vast range of audiences. (Still might be advisable to leave your Grandmother at home though).